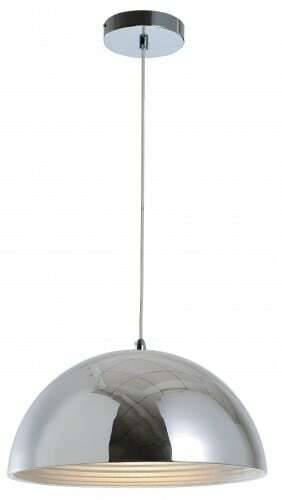 Thank you for submitting your question about Hanging loft lamp Mads chrome E27 60W. 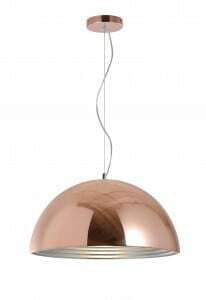 Hanging lamp MADS , whose design was created on the basis of the design of the famous Art Cupola lamp. 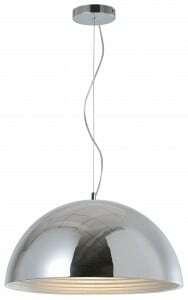 Lampshade in silver with a diameter of 40 cm gives diffused light. The lamp is suspended at eye level, above the table, e.g. in the dining room - beautifully illuminates the table itself. If we want the MADS pendant lamp to have the character of a main lighting lamp - just set its height higher than in the previous example. The possibility of adjusting the height gives us a wide range of maneuver and the seemingly simple lamp can have several applications. The MADS lighting fixture has a simple form and a trendy silver color, thanks to which it will fit into the landscape of any room. An ideal proposition for this type of lamp is its function as a lighting fixture illuminating the dining room table. It is beautifully promoted as the main lighting - eg in the kitchen, and several MADS lamps hung above the island are a stylish and designer finish of any room. The manufacturer gives a 2-year warranty for each lamp in this series. 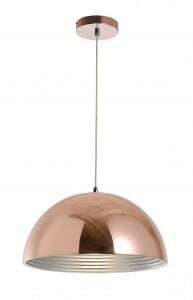 Our offer also includes other sizes and colors of the MADS hanging lamp . E.g. copper color.